Why buy east when you can Mumbai west? 11/9 The Age there is scant recognition of the amount of infrastructure needed to support these numbers. Point Cook is called "Mumbai Cook". According to the article: one of Melbourne's newest suburbs tells an old migration story that echoes the history of places like Carlton's Little Italy - Lygon Street - or Richmond's mini Saigon - Victoria Street. Comparing Melbourne's multicultural imprints of Victoria Street and Lygon street and Richmond simplify and hide the real issues here. It is the reluctance of our political leaders to acknowledge the world's global threats, and the impact of on-going and limitless population growth on an already stretched Australia's resources. Our wide and open spaces are being turned into housing estates! What was stimulating in the past, and helped us create an economy of scale, is now toppling our population over the point no return, and human numbers will keep increasing. Delhi and Mumbai rank among the world's top most populated cities. Mumbai, with a population of 20.4 million, occupies fourth place behind Sao Paulo in Brazil. Undoubtedly, like in Australia, urban sprawl will keep continuing and real estate prices keep increasing. Property in Mumbai is already some of the most expensive in the world, and no doubt there are some great positives about the city, and some have become wealthy! Everybody is searching for good jobs in Mumbai for earning money that can helps them to survive their life. But many of the people are unable to get the job even if they are talented and meritorious. Currently Mumbai stands communally far more polarised in terms of population distribution than ever before, and this is one of the primary reasons for the presence of crime in the society. The burgeoning crime rates to the fact that more and more unemployment has been created after the shutting down of the textile mills in and around the city. In India, religious and caste divisions generally coincide with economic divides, and these give rise to an amplified form of social division. The city's crime graph, like its burgeoning population, is also rapidly rising: over the last decade the city has witnessed a 52% rise in crime. Sankar Chatterjee, curator of paleontology at the Museum of Texas Tech University says that a meteorite more than 25 miles wide hurtling toward Earth at 36,000 miles per hour and caused massive destruction. In fact, the exact scenario played out 65 million years ago near present-day Mumbai, India, and could be the smoking gun that ended the dinosaurs’ reign on Earth. The sixth extinction can't be blamed on meteorites but to human overpopulation! Bringing Mumbai to Victoria's west is about importing this global threat to Australia. Despite the converging threats of climate change, peak oil, peak soil, extinctions, rising costs of water, power and infrastructure needed to maintain our lifestyles, growth continues! Urban sprawl means additional infrastructure are needed for power, water, increased transport and health costs, not to mention the increase in greenhouse gas emissions! The Australian Conservation Foundation has called for clear goals to stabilise our population, saying that a rising population will make it much harder to reduce greenhouse gas emissions, restore our rivers, biodiversity and soils to health and ensure a good quality of life for everyone. Infrastructure spending will always be inadequate in keeping up with such high growth. However, the tremendous financial and political power of the growth-lobby is far greater than the threat of anthropogenic climate change, or any global or local environmental or sustainability concerns. Many parts of Melbourne's west look and feel more like the third world than Australia with the crime, violence and dysfunction to match. Sadly, the east is rapidly moving in the same direction. Not that the people arriving here are disfunctional or inappropriate as Indian people are generally good migrants and work hard - more that can be said of some who have come here previously! However, the problem is numbers. "Multculturalism" and "diverstity" is not needed now, as we are already diverse and multcultural. Our growth is not simply like a teenager going through a growth spurt! Teenagers grow to adults, then growth stops! Australia has no population plan, and no policy or science to support our ongoing growth or carrying capacity. We are growing limitlessly and recklessly. 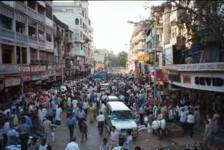 With the parallels between Mumbai and Melbourne, population growth can't be humanely cut back! We are simply importing the Earth's problems and spreading them here. Our elected leaders are choosing to ignore the rest of the globe, its threats, and continue with their retro "populate or perish" mentality. Victoria's sterile West, grazed out and used for industrial/defence purposes, should be revegetated and stocked with with biodivesity as a buffer, insurance, against climate change instead of being bulldozed and concreted over with housing estates. According to Victoria Naturally Alliance report, Victoria's natural environment and biodiversity are under serious stress. More than half of the state's native vegetation has been cleared, 44% of Victoria's native plants and 30% of our animals are threatened or extinct. Unfortunately, evidence shows that the condition of Victoria's land and biodiversity is continuing to decline. Why are developers so hard to say NO to? The west is overgrazed farm land, industrial or defence areas. They should be re-vegetating and restoring the wastelands, not bulldozing and making more concrete housing estates. Why are developers so hard to say NO to? People are being forced to live there, not because it is attractive, but because of outlandish housing prices in other urban areas. The tremendous financial and political power of the growth-lobby is far greater than the threat of anthropogenic climate change, or any global or local environmental or sustainability concerns. Where in Australian/Victorian law can be found traditional Melbournians authorising immigration free-for-all such as being allowed to take over by Brumby? If Brumby was indeed a 'Kumar' from India, I suggest the local reaction would approximate that of Fiji's Frank Bainimarama, who saw the Indian invasion of his country and did something to stop it - overthrew the government! Hale Frank! Frank and Colonel Sitiveni Rabuka before him (1987), each recognised the demise of ethnic Fijians being overrun by Indian Fijians in Fiji. As Brumby's economic immigrants take local jobs, houses, rentals, offer job preferences to their nationals in employment, change shop names from English to Hindi, traditional Australians are sidelined, marginalised and any complaint quickly labeled 'racist'. What chance do locals have when government sides with the invaders? This is 21st century Vikingism, even including the slavery - Indian immigrants have been found guilty in Australia of slavery! Australia's Celtic virtues are being bulldozed by Brumby and LibLab political correctness, allowing skilled immigrants first choice over local Aussies - jobs, housing, childcare, loans, you name it. Under Brumby, immigrants have more rights than locally born Australians! > Under Brumby, immigrants have more rights than locally born Australians! Are you suggesting perhaps that immigrants should have less rights, simply because of where they were born? Did you do something particularly worthwhile in a past life, in order to have earned the right to be born in this country? It’s just luck of the draw Mr Marlowe. You could just as easily have been born in a slum in Mumbai. Also what exactly are Australia's Celtic virtues? I have primarily Celtic ancestry, however I don’t believe there is anything particularly virtuous about this. Vivienne, please be aware of what kind of message these posts present. There are far too many people like Mr Marlowe in this country, and unfortunately articles like yours give them validation that they don’t deserve. If you are truly concerned about over-population, and climate change, then you should realise these are global problems. Simply shutting our borders to these people achieves nothing. Global economic integration and growth, far from bringing a halt to population growth, will mean that the consequences of overpopulation in the third world are generalized to the globe as a whole. There is a recent tendency of the environmental movement to court "political correctness" by soft-pedaling issues of population, migration, and globalization. Human overpopulation is the central issue that affects every other problem humanity faces. IF we are to survive this century, shouldn't we curb the rabid growth of the one species that consumes so much? Keeping our borders open gives peoples of the world migration options, and aid, and thus negates the urgency to curb their numbers. We in Australia can stabilize our numbers by reducing immigration to about 50,000 a year. However, we are told that "more is better" - a bigger "herd" is safer and more prosperous. We need to be wary of the illusions of the human herding instinct, and economies based on limitless growth. A Ponzi demography is essentially a pyramid scheme that attempts to make more money for some by adding on more and more people through population growth. Population growth - through natural increase and immigration - means more people leading to increased demands for goods and services, more material consumption, more borrowing, more on credit and of course more profits. If each nation were responsible for their borders, their carrying capacity, their own birth rates and their own economies, there would be no delusions about the real size of their territories, and they are more likely to live sustainably - knowing that their resources are limited and local. Our immigration should centre only on humanitarian cases, not economic immigration, and foreign aid should go hand in hand with family planning, women's and child health services and facilities for the education of women to stabilise populations. On the contrary, we need a new wave of nationalism. Immigration doesn't "solve" overpopulation pressures but simply shuffles the problem around the world and buys more time- until we hit the wall! A new wave of nationalism is the last thing we need. I've always considered that a bad word, somewhere between patriotism, and racism. To each their own I guess. You're certainly not alone in your views. In fact the vast majority of Australians would clang their stubbies together in raucous agreement. After just 150 years of oil extraction, we have burned through roughly half of it. The world is consuming four barrels of oil for every one we find, more than 80 million barrels of oil every day. Optimists believe new technologies will arrive before we reach rock bottom. Major oil exporting nations are well past their supply peaks, with giant fields rapidly diminishing in size and new finds proving to be small and relatively insignificant. This desperation is why we had the Gulf of Mexico disaster! Reports from government and military agencies in the United States, Great Britain and Germany all point to shrinking oil supplies as a growing reality fraught with potentially drastic consequences —resource wars, price shocks, shortages of fuels and vital goods, and broad economic decline. Already there are reports of food shortages. The ice covering on the Himalayan and the Tibetan Plateau is also beginning to melt, and this could have long-term implications on global grain harvest too — as these also nurture the irrigation systems of agriculturally important countries in the region — China, India and Pakistan. Instead of building more highways, we must expand public transportation and make it more appealing, accessible and affordable. Investments by governments and the private sector must be designed to bring manufacturing and food production processes closer to our homes. Nations must become, ultimately, responsible for their own borders. Global oil production is likely to start its inevitable decline sometime in the next few years, perhaps by 2015 or earlier. Cities that prepare in advance for the future oil shortages will have tremendous advantages over those that keep believing that business will always be as usual. If fuel gets towards the CSIRO scenario of $8/litre by 2018, there will be a lot of changes needed in people's travel habits. Oil Vulnerability Planning should be commonplace, just as people assess their bushfire risks and have emergency plans in case there are major bushfires. Peak Oil is just one of the problems facing defence forces, but perhaps a critical one in that the globalisation of manufacturing and supply depends on it . Globalization is likely to emerge as a failed strategy. What credible Government could not be labelled 'nationalist'? Opposition to high immigration is equated by Eugene with 'nationalism', as if to label anything as 'nationalistic' automatically discredits it. This is often a tactic of the left. From such logic, it would follow that were ordinary Australians to achieve the control over their standard of living and quality of life (which they now don't have) a terrible risk would arise. It is as if Eugene were suggesting that, in the longer term, there would be similar consequences to infamous variants of 'nationalism' when millions died, such as in German Nazism, Stalin's Russia, Pol Pot's Cambodia, the Rwandan genocide of the 1990's, and the First World War. It would be interesting if Eugene could provide us with a single example of a credible government at any time in history that could not have been accused of being tainted with the supposedly evil trait of nationalism. Contrary to mainstream leftist mythology, which holds early communist examples as pure and genuine, even the early Bolshevik government from 1917 until 1923 implemented programs based on narrow nationalism on more than one occasion. The first example was the Brest-Litovsk treaty of 1918 in which the Bolshevik Government ceded vast quantities of territory formerly controlled by Tsarist Russia to Germany. The territory included almost all of the Ukraine and the three Baltic States of Latvia, Lithuania and Estonia. Because the leaders of the Bolshevik Party of Russia and of the Tsar's former Asian colonies allowed the Germans to brutalise the people of these countries, the Germans signed a peace deal with the Bolsheviks, thus permitting them to go on ruling. The Germans were thus able to avoid fighting a war against their former Russian enemies in the East. This freed them to almost win their war in the West against Britain, the British Commonwealth, France and the United States in its military offensive in 1918. A second example was when the Red Army entered Polish Territory in 1920. Then too, the Soviet Union appealed to Russian nationalism. It even sought, and obtained, the help of the Russian Orthodox Church. Politically this led to the counter-ignition of Polish nationalism and the military defeat of the invading Russian Red Army by the Polish Armies led by right-wing Marshall Pilsudski. So, if the early Russian 'Communist' government could not be held to be untainted by nationalism, who could be? At least nationalism is one means by which a community can assert its own rights, as long as the leaders of that nation are committed to the welfare of all members of that community and not just to a wealthy elite. Without nationalism, the rights of the poorest of the national community are sold out to wealthy foreigners as they were in Vichy France, Holland, and Norway after 1940 or in Japanese-occupied Korea. How much better have recent 'non-nationalist' Australian governments been, where they have allowed land and strategic assets to be sold off to powerful foreign investors? By the way, a new sell-out looms now in the contemplation of a Chinese [nationalistic] government built new power station in Victoria's Latrobe Valley. How different were the actions of those puppet regimes from past history? I can't cite the exact pages in which the events described by James are covered, but Isaac Deutscher's trilogy biography of Leon Trotsky (written in the 1950's) probably covers them involumes 1 and 2 ("The Prophet Armed" and "The Prophet Unarmed". (Volume 3 is "The Prophet Outcast." ) Although Deutscher was a Trotskyist, the content of these books allows us to see that Trotsky failed to take a firm, decisive stance at critical times in his career. Deutscher's narrative is even more revelatory of faults in other leaders of the Russian Revolution. Trotsky was one of the most respected political and military leaders of the October Revolution and, reading Deutcher, it seems likely that if Trotsky had simply followed his own, usually correct, critical analysis of the wrong courses taken by Lenin and (especially) Stalin, outcomes might have been so much better. The Russian Revolution could have been spared its subsequent monstrous perversion by Stalin and his followers and many 20th century nightmares could have been avoided. Deutscher's monumental works contained revelations for me when, as an enthusiastic Marxist, I read them about 20 years ago. The failure by the Marxist "Revolutionary" movement to pass on Deutcher's insights puts most supposed (anti-Stalinist) "Revolutionary Marxists" in a poor light and fuels a reasonable suspicion that they are corrupt. The supposedly pure and virtuous leaders of the early Soviet Bolshevik Party allowed nationalism to influence their decisions (both rightly and wrongly). This makes the cannonistic denunciations of 'nationalism' by 21th century "Marxists" look as ridiculous as they are. Why are high-immigration proponents silent on housing poverty? Thanks, Vivienne. You have stolen much of my thunder. Eugene, at first, appears to agree with our rejection of 'growthism'. However, he ignores the fact that, if the countries, with higher birth rates, have somewhere to export their surplus population to, they will have even less incentive to limit their own birth rates. High immigration rates deny many rights of citizens of countries that have achieved population stability. The obvious example is Australia's scandalous housing poverty. No-one in Australia on a normal income can any longer afford to buy or rent a free standing home, even though this was possible little more than a generation ago. During the 2009 Queensland state elections, I learned just how miserable housing conditions were for some of our citizens when I met a woman on social welfare who actually had to share, not just a room, but a bed with a (female) stranger with whom she was not even intimate! Of course, this is a more extreme example of housing poverty. Where available housing is vastly less than what is needed, then some have no choice but to rely on such substandard arrangements for shelter. Many others, even those with professional occupations and correspondingly relatively high incomes, suffer housing poverty, although not quite as extreme. In inner city Brisbane, I have observed a neighbours' qualities of life going down year afer year as landlords, able to take advantage of rising demand, hiked the rents regularly. Two years ago, one neighbour ceased taking his overseas holiday during the Christmas break, because his disposable income had been so reduced by regularly increased rent. The inhabitants of the second of the double flat in which he lived, formerly a husband and wife with a child, have only recently broken up and moved out. In part this was caused by rent rises. Who could have imagined, when I was growing up in the prosperous Australia of the 1960's and 1970's that after decades more of economic 'growth' and 'reform' that some residents' quality of life could have been so reduced? Rather, resources have been consumed by the enormous amount of resources plowed unproductively into the property 'industry' and the costs borne by the existing community to allow more immigrants (more roads, dams, power stations, water desalination, etc.) to live here. On top of this, wealth has been unfairly transferred out of the pockets of the poorest in the community through higher housing prices and higher rents to some of the wealthiest. All members of the Australian community cannot, on average, be other than poorer. The already poorest can only have been made far poorer still. That the growth lobby gains, in circumstances where wealth is destroyed and impoverishment increases, is stark evidence that our economy is very unhealthy and dysfunctional. The fact that defenders of high immigration are silent on the impoverishment of their fellow citizens during recent decades can be no accident. To me it confirms that their claim to want social justice and a fairer world is a sham. Either they are consciously acting to serve the interests of those who gain so much at our expense from high immigration or they are the dupes of those who do. Furthermore, unless, they wish to see a rate of immigration, many orders of magnitude greater than even the most rabid "open borders" proponent is prepared to publicly argue for, only a small proportion of the poverty-stricken in the Third World can possibly hope to have their lot improved by immigration. Ecouraging skilled workers to leave the Third World for higher pay in the industrialised countries can only further impoverish those left behind. An accountable Government, acting in the interests of its citizens would immediately act to end this. It would begin by limiting immigration in accord with the wishes of the vast majority of inhabitants and it would introduce disincentives to land speculation and landlordism in favour of people owning the houses in which they lived. Furthermore, it would expand publicly owned housing to help meet the needs of the poorest for shelter. > Eugene, at first, appears to agree with our rejection of 'growthism'. However, he ignores the fact that, if the countries, with higher birth rates, have somewhere to export their surplus population to, they will have even less incentive to limit their own birth rates. It would seem logical that as population density increases, birth rates should decline. However it just isn't the case. Indian cities are already drastically over-crowded, but this is doing nothing to slow the birth rate. Extremely high birth rates are generally a product of poor education, and social innequality, both of which are exacerbated by over-crowding. In 3rd world countries having a large family is not a lifestyle choice. It is often simply a matter of survival. In Australia when we retire, we know that ultimately the government will take care of us, even if we don't have a cent to our names. In India, if you don't have money, and you don't have children to support you in your old age, you either beg on the streets, or starve. I wonder how many people who criticise immigration policies have actually travelled to a 3rd world country? It's a very enlightening experience to spend some time as part of an ethnic minority. 1. Scrap the baby bonus, and instead introduce tax penalties to discourage people from having more than 1 child. 2. Make it easier for Australians to adopt children from 3rd world countries. Adopted children should be exempt from the tax penalties. 3. Increase funding for support services, to help immigrants integrate effectively into Australian society. 4. Introduce a foreign exchange program as part of the core education curriculum for all secondary school students. If all Australians spent some time in a 3rd world country I think it would go a long way to stamping out racism, which unfortunately is all too prevelant in Australian society. 5. Increase foreign aid, primarily in the form of education services to 3rd world countries. This wont fix all the problems, since ultimately capitalism and global trade is at the root of all that's wrong in the world, but I think it would help. This YouTube Broadcast, "Immigration, World Poverty and Gumballs - Updated 2010" graphically illustrates my point that immigration, unless at a rate vastly higher than even its strongest proponents are prepared to publicly argue for, will do nothing for 99.9% of the Third World's impoverished. Although high immigration cannot hope to help the poor of these countries, it will almost certainly impoverish the poorest in countries like the Australia and the US and cause incalculable environmental harm. As Roy Beck says, the only way we can hope to help all, or, indeed, even a substantial proportion of the world's poor is to help them where they live. In the last century and a half another bold challenge was mounted to re-order our natural affinities. Christian universalism and the rootless cosmopolitanism that was world Jewry found a rival in Marxism. In 1848 Karl Marx told the workers of the world to unite. Incredibly that call is still heard today, albeit among sometimes obscure factions. The Socialist Party of Tampa Bay declared in its 2007 platform, “working people have no country, but rather an international bond based on class.” A canvass of similar groups across Anglo-America would not necessarily reveal such blatant indifference to national interests, but nevertheless take up open immigration and refugee positions and support blanket amnesty for illegal aliens. What is critical to the understanding of the Marxist attitude to nationalism is that it takes an entirely pragmatic approach. Marx drew a distinction between good and bad nationalism. “The nationalism of the workers belonging to an oppressor nation binds them to their rulers and only does harm to themselves, while the nationalism of an oppressed nation can lead them to fight back against these rulers.” Thus Marx favoured Irish nationalism, but not English. He opposed the national movements of the Southern Slavs, but supported the Indian rebellion against the British. Lenin warned that “workers who place political unity with their ‘own’ bourgeoisie above the complete unity of the proletariat of all the nations, are acting against their own interests.” To do so, to fall victim to nationalist affections, was to evidence “false consciousness”, an inability to recognize those interests, interpreted of course by party cadres. Such is the European Left’s identification with the Other at the expense of the resident national that, in the name of anti-racism, it was possible for left-wing novelist Umberto Eco to declare his hope that Europe would be swamped by Africans and third world emigrants just so to “demoralize” racists. And such is the identification of the AFL-CIO with 13 million illegal immigrants as potential recruits that it supports amnesty and essentially a corporate welfare program that reduces wages for the lowest of American workers. A scheme which advocates call “liberalism” but American workers call an invasion. The Canadian Labour Congress (Edgar Bergen) and its social-democratic parliamentary arm, the NDP (Charlie McCarthy), sing the same tune. Crocodile tears are shed for “undocumented” workers who allegedly make great contributions to the economy, according to their hire-a-left-wing-think-tank. But Statistics Canada’s conclusions are the same as those of Dr. Borjias are for American workers. The British Trade Union Congress tried to put one over on the public with a September 2007 report cooked up by the left-wing Institute for Public Policy Research that maintained that amnesty for illegal immigrants would net the Treasury 1 billion pounds annually. More careful analysis revealed that amnesty would cost British taxpayers up to 1.8 billion pounds a year. But just as Christian thought is not monolithic, neither is social democratic thought. Arguably the most famous and independent socialist intellectual of the English speaking world, George Orwell, once remarked that “in all countries, the poor are more national than the rich.” Bukharin was wrong. For the working class, national identity was just as important as class identity. And now finally, after their constituents have been battered by one of the greatest migratory waves in history, that saw the United States for example import the equivalent of three New Jerseys in the 1990s alone (25 million people), maverick social-democratic and socialist leaders in the tradition of Victor Berger, or Jack London or Canada’s J. S. Woodsworth are staking out a claim for national, as opposed to international, solidarity. Former Labor Premier of New South Wales, Bob Carr, also argued for the acknowledgement of limits. Along with fellow Labor MP Barry Cohen he has joined Australia’s leading environmentalists Dr. Tim Flannery and Dr. Ian Lowe in exposing the myth of Australia as being a big empty land begging to filled up with people. “Our rivers, our soils, our vegetation, won’t allow that to happen without enormous cost to us and those who follow us.” He calls for severe immigration cut-backs and a population policy. In 1970 I signed and supported the notorious "Waffle Manifesto" which urged that the NDP---Canada's social democratic party---return to its socialist roots with a commitment to reclaim our economy and culture from the American Empire and reject further integration into the global economy. Trotskyists and right wing commentators made common cause by accusing us of "nationalism", which to their minds conjured up sordid images of death camps and wars of aggression. Leading socialist economist and expatriate American Mel Watkins --a key force behind the Manifesto--- retorted with a famous response that became our rallying cry: "The road of Canadian nationalism does not lead to Auschwitz. It only leads away from Washington." Amen. •	Open borders, by offering an escape hatch or safety valve for developing nations , allows them to avoid to facing up to their unsustainable and growing population. •	Open borders is a proven stimulant to fertility in countries of emigration (eg. Central America and the West Indies). The more children had, the greater the chances that one will land in the promised land and forward remittances or anchor and sponsor more family émigrés. •	Open borders magnifies the ecological impact of migrants from poor to rich countries, making their numbers more significant. •	Open borders, by boosting the population level of countries like the US, Canada, Australia and Britain, makes it difficult for them to achieve sustainability, and until they do so, they have no credibility when they tell developing countries to stabilize and reduce their populations. A “do as I say” rather than “do as I do” policy simply will not work. We have to clean up our own act here before we go preaching to the Africa or Afghanistan or the Philippines about constraining population growth. It is curious that in the immigration debate---whenever such a debate is permitted to occur------the Green-left Globalists switch horses in mid-stream. Within the confines of our national borders, they tell us that what is decisive is not how many people we can accommodate, but where they are situated. The classic mantra is "It is not whether we grow, but how we grow". We can double or triple or quadruple our numbers so long as we steer the population to urban centres, and pack them like sardines in a can to lower their per capita energy consumption and keep greenfield acreage untouched, along with ecologically significant nature reserves. Apart from the fallacy of low-energy urban living, and the political improbabilities of wresting land-use decisions from developer-controlled city councils and regional parliaments, this argument is incongruent with their stance on immigration. At that level of discussion, they tell us that it doesn't matter where people live on this planet, it is only their numbers which should be of concern. Moving people around from country to country, or excluding them from doing so does not address the problem. It is like the proverbial futility of moving deck chairs on the Titanic. Immigration, in their imagination, is not a population policy. Besides, building fences won't keep the global population tsunami from sweeping over us, nor will it keep out global warming. In other words, fences inside our borders are a solution to runaway population growth driven by hyper-immigration, but fences around our borders are no solution to runaway global population. Confusing, isn't it? Now get ready to be more confused. Canadian Green Party leader Elizabeth May, who argues for an immigration quota 25% larger than the Harper government's (already the highest per capita intake in the world), has pushed the traditional green line that "smart growth" planning can confine our growing population within ecologically benign urban boundaries. But when faced with complaints that our major cities are already strained beyond liveability with migrants, she has called for their dispersal to rural localities, despite the fact that people have left these regions for compelling economic reasons. So now we have a Green Party that tells us that we should squeeze tighter in urban centres, and relocate to the empty hinterland at the same time. The Green message is now clear. Fences work, but they don't work. Cram into the cities, but settle outside of them. And if you don't like our principles---just wait---we will find other ones for you. If that is not enough contradiction for you, then along comes the climate-obsessed Eco-Marxists. They oppose the free and unfettered passage of goods across national borders because they oppose the corporate agenda. But they support the free and unfettered passage of people across national border because they support the corporate agenda of smashing the indigenous labour force with cheap imported slave labour. Except that they call their globalism "international solidarity" with migrant workers. Native-born workers and native culture are expendable. And their idea of fighting climate change is to shift people from nations with low GHG emissions to nations of very high GHG emissions. Go figure.